Take a journey into a retro wonderland with a style that draws upon several decades of interior design trends. Approaching a concept of such depth requires a bold touch and a seamless melding of personality and comfort. Interior Designer, Kelton, from Versaform faced this challenge head-on. 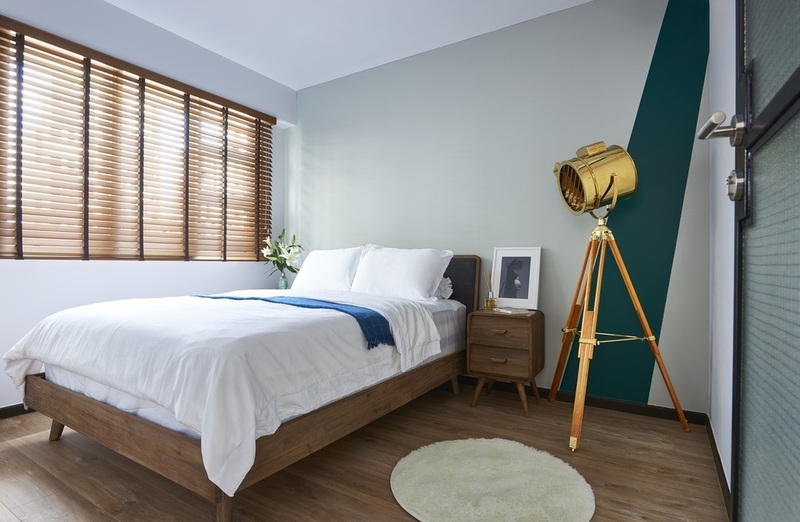 The canvas is a 4-room HDB Flat at 93B Telok Blangah, Singapore. Here, a stunning transformation took place, turning the space into a dream home. Timeframes overlap and history has shown that cultural expressions are prone to revival. 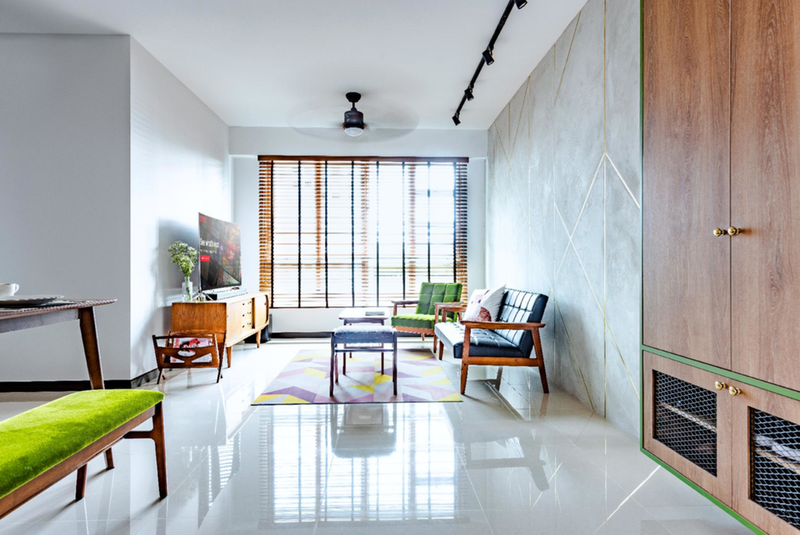 Interior designer Kelton was more than pleased to accommodate the preferences of the retro-loving homeowners, seeing that one of his passions lies in a very fitting affinity towards retro design. It should come as no surprise that, upon hearing of the opportunity presented to him, he eagerly proposed a concept that he had in mind. 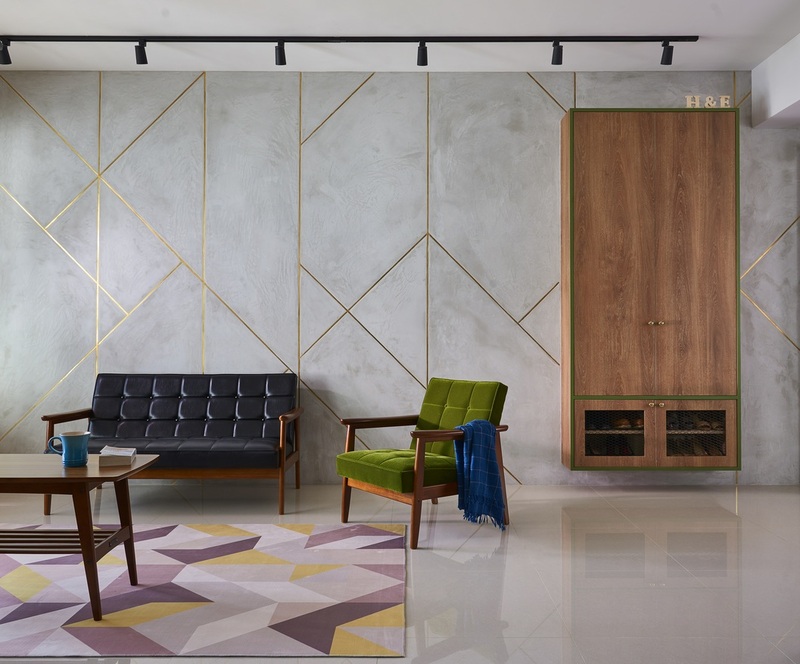 In order to stay true to the requirements of a retro style design, the designer played with furniture from the Karimoku 60 collection that the homeowners had already gotten their hands on. They had requested that the green-colored furniture be integrated into the overall design and with that, a theme stemming from the vibrant focal point of these stunning Karimoku pieces was formed. A combination of edgy industrial-style accents and a mixture of deep grays as well as light greens feature prominently here. Kelton worked on infusing the living room with a strong sense of visual nostalgia, along with unique contrasts as a means of maintaining the essence of vintage without clutter. A marriage of worlds work at both ends of a very large spectrum. 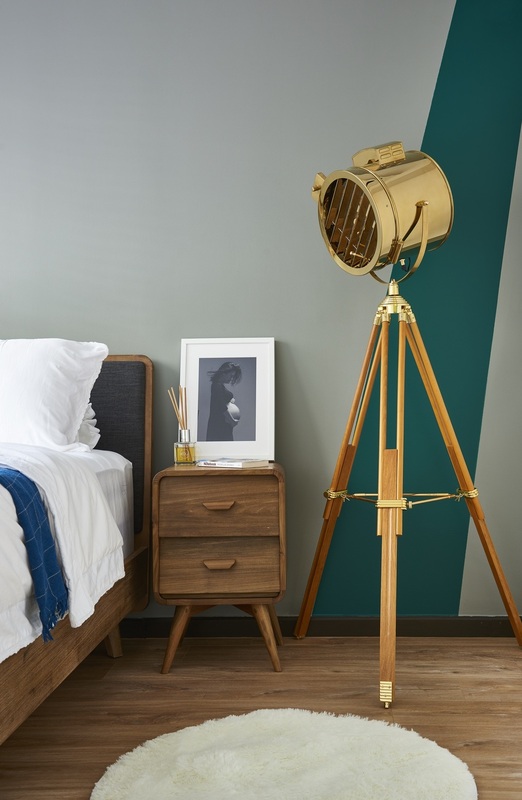 Existing between vintage and modern, in harmony and balance, creating a fluid transition from the familiar consistencies of retro to splashes of a more current era. 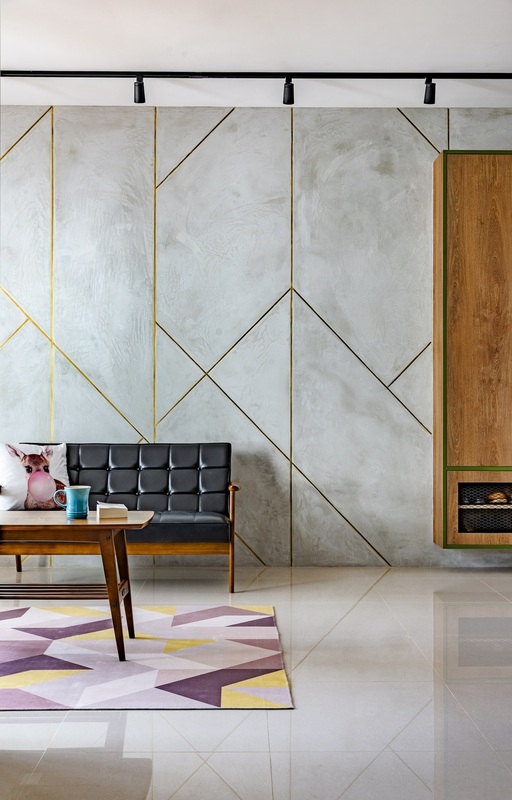 Marked with a “scraping” effect cement screed and an intricate arrangement of brass strips, the wall of the living room stands out as a remarkable framework that captures the individuality of the home in a holistic way. A clean, wooden, two-door shoe cabinet floats slightly above the reflective tiled floors against the wall for an interesting addition. Ventilation for the shoe cabinet was instilled into the design of the piece with an added wire mesh cage displayed at the bottom. 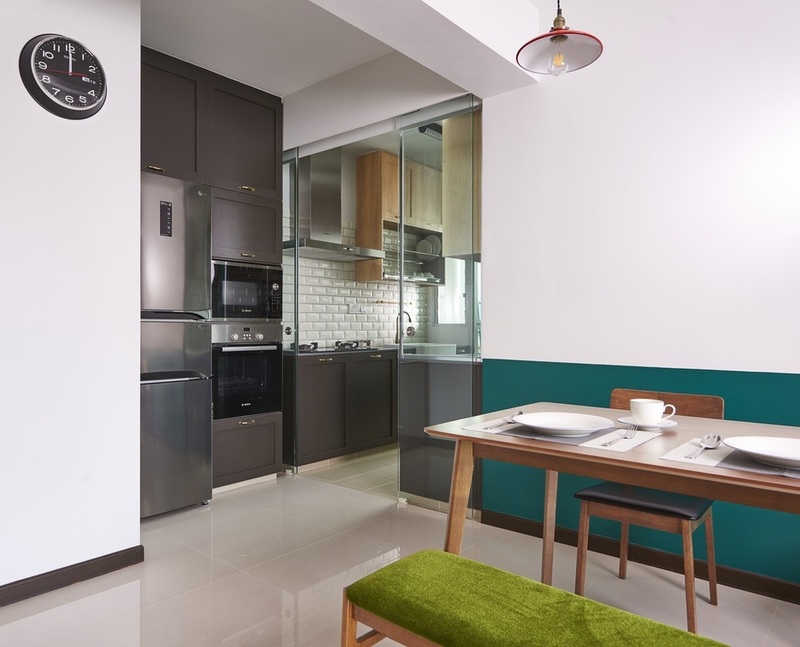 The placement of green provides a captivating yet subtle break to this mainly neutral-colored portion of the home and can be found in the simple, green chair in the living room as well as through thin outlines that run along the edges of the wooden cupboard. Through the implementation of solid colors to create a half-painted wall, an embodiment of classic-retro has been achieved in the dining area. Low furniture and a quaint, green bench play a large role in the spirit of the theme here while a vintage-style, Seiko clock hangs on the wall. Here, spaciousness is also by design with one of the key changes made being the removal of a wall that originally separated the dining and kitchen sections. A clear blend of the best of both worlds, rows of vintage-style cabinets that leverage on a framing design for added effect surround the home’s wet kitchen while an innovative layout cleverly facilitates the juxtaposition of different colors and materials used for both the lower and upper cabinets. Coupled with large tiles, these bring depth and width to this otherwise minute part of the home. The designer has chosen the fitting of porcelain sinks instead of the more commonly used stainless steel or limestone, in order to further emphasize the retro theme that binds the entire experience. Traces of brass are incorporated into the design as a follow up from the living room. 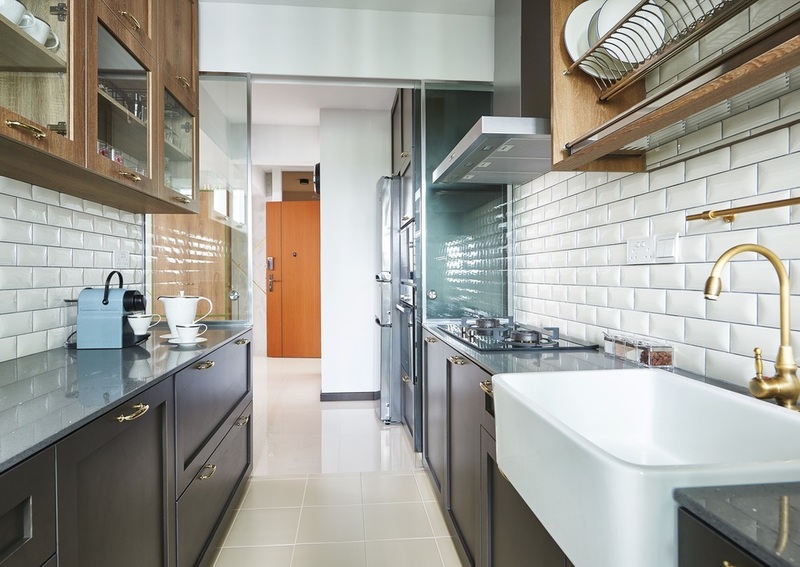 The dry section’s oven and fridge are conveniently situated closer to the dining area and both sections of the kitchen (wet and dry) are separated by a glass sliding door that functions as a means of segregating and organizing the overall layout while letting in some natural lighting. Defining the ultimate theme of the home, the master bedroom continues on from the retro narrative while deftly weaving in modern movements. 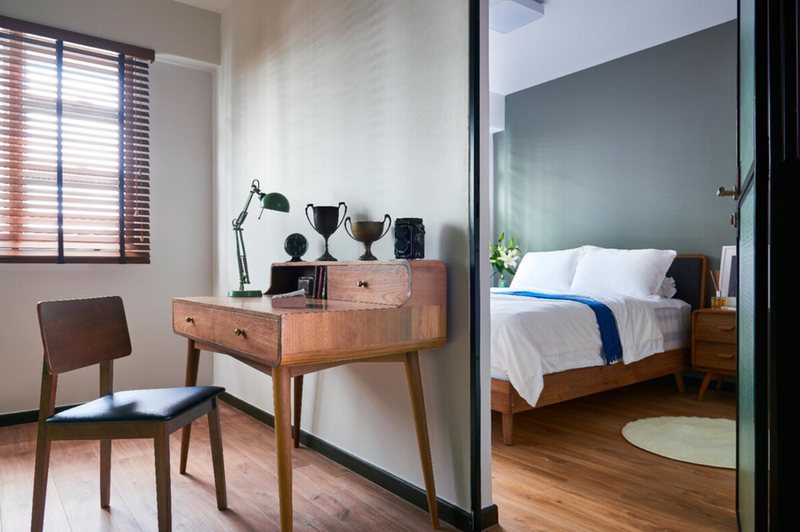 A seamless incorporation of smooth brown wood, pure whites and subtle splashes of calming green all work together to establish a cozy yet fresh and exciting atmosphere. The final vision can be digested here in this common room which was converted into a master bedroom. The original master bedroom was transformed into a walk-in wardrobe and study area in order to craft a smaller space for the sleeping quarters as well as free up a section for other activities. This is yet another functional decision and leads in towards uncovering a unique take on the layout of common flats. By hacking away sections of the wall and adding a wire-meshed glass door at the entrance of the new master bedroom, one entire room is segregated into a three-part series where functionality and style are wonderfully coordinated. Each corner serves its own specific purpose- a walk-in wardrobe for the lady of the home who wanted more storage space for her belongings, a study room where the owners can get work done without any distractions and finally, a sleeping space for the couple to wind down after a long day. Furniture was purchased with blending in mind in order to not disrupt the ongoing flow of the interior. Vintage-hued, green doors were included as well as various ornaments that complemented the overall theme. In order to completely transform the tired aesthetic of the master bathroom’s standard BTO structure, floor tiles have been overlaid with hexagonal alternatives made of cement screed. 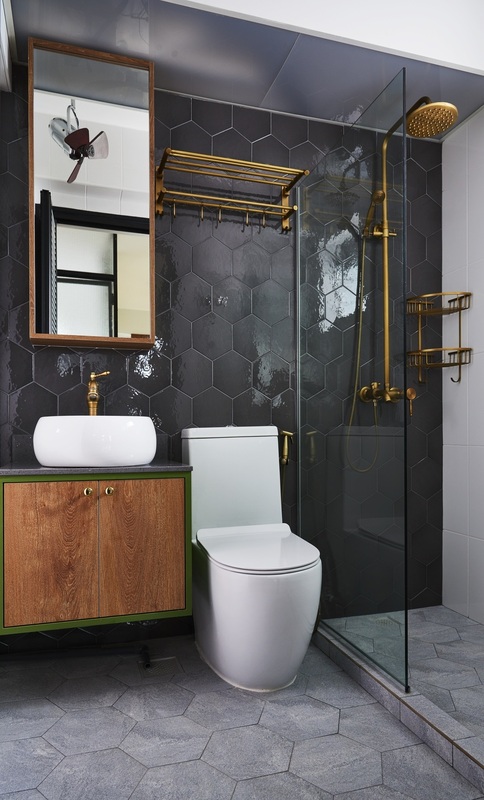 Black polished tiles were chosen for the wall and metal fixtures were given a bronze treatment that played into the overarching boldness of vintage throughout the home. A grand Louvre door was added to the section and recurring colors that can be found throughout the rest of the unit have been incorporated. Sophisticated, fun and multi-layered – this unconventional BTO design has definitely redefined retro and brought it to another level. Want a home like this? Look no further and get a free consultation with Dezainn today! We will match you with the best interior designers in Singapore to create a space you can call home.